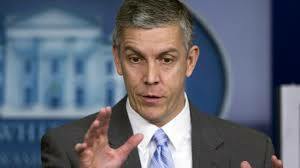 Common Core curriculum standards are being upheld by Education Secretary Arne Duncan. He is sticking with controversial new Common Core curriculum standards and standing by New York State's education chief after teachers wanted him fired for forging ahead with the changes. Duncan praised Commissioner John King Jr. as a "remarkable leader" who positioned New York as a pacesetter in the national push toward early education and higher standards. Duncan offered his endorsement at a New York University event Thursday, days after delegates from the state's largest teachers union targeted King with a "no confidence" vote. King joined Duncan at the event and afterward said that the union vote last weekend was a product of the "politics" surrounding the state's implementation of Common Core and related teacher evaluations. "I also think it reflects how hard the work is in trying to raise standards for both teaching and learning across 700 districts," King said. The delegates, from the 600,000-member New York State United Teachers, also withdrew support for Common Core standards as applied in the state and said they supported parents pulling their children from related testing. Both leaders acknowledged the "drama and noise" surrounding the changes, but Duncan advised city and state education leaders to "stay the course" while working with urgency, humility and courage. "Anytime you challenge the status quo, anytime you raise the bar, there's lots of pushback. That can be very scary," Duncan said. During his address to students and invited guests, Duncan avoided specifically saying "Common Core." King went about 10 minutes before specifically mentioning the term, which has become a point of derision for critics. Duncan called education "the civil rights issue of our generation," echoing a speech he gave Wednesday night at the National Action Network conference in the city. He said tens of thousands of black and Hispanic students don't finish high school in New York City. He said at least two-thirds of students who graduate and head to City University colleges need remedial classes. The new standards, he said, will better prepare all students for college and the workforce and boost the U.S. in international education rankings, where it lags. "I promise you, the next couple years will not be easy," Duncan said. "There will be bumps, hurdles and road blocks and people will say, 'Stop, go back to the old days,' but it's so important this community have a vision of where we're trying to go."